Well, I am not going to lie, the blog was Heather’s idea, and it is likely that going forward she will post more often. Nevertheless, I will give it a go, and try to get some post out there for your entertainment. Speaking of entertainment, I am listening to some tunes as I type, and Air Force Ones by Nelly just started playing. Do you remember that song? Yeah, quality rap music. Give me two pers. Anyhow, blogging, what is it all about? Well today I ran across the video below, and I think that it gives a pretty good explanation for those of you wondering about blogs. Well, I hope that you all enjoy, and if you have some post ideas for us or just want to say hello, leave a comment. Elisabeth and Steve Ball: The Chaseys were in dire need of some serious Ball-face-time. 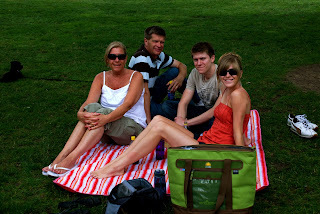 It was so good to have them here. They are the kind of company that I truly enjoy…the comfortable kind. They were our excuse to try out Grape Expectation, a wine cafe in Plymouth – SO GOOD! We also went to the Henry Ford Museum and went on the assembly line tour. Kind of strange to watch people while they work, but I guess they’re used to it…? Ryan Chasey: Ryan has always been a fan of the Dodgers. 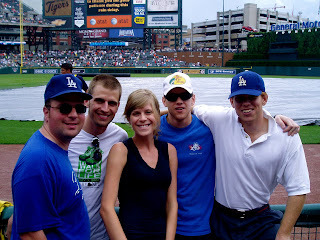 So, when he found out the Dodgers would be playing the Tigers in Detroit this year, he and his friend Ben (who also has a brother who lives in Detroit) decided to meet up to go to the games. We joined them on Sunday – the day when the skies decided to open up at the bottom of the fifth and cause a mid-game rain delay. It was a hot day, so the rain definitely cooled things off a bit. The Tigers swept the Dodgers…sorry, Ryan. Most recently, my mom, dad and brother, Erik, came to see our new house in Plymouth (we’ll post pictures of that later). In Mom fashion, she came with goodies. Among them were a pot of flowers for our front porch (don’t they look nice?) and a few bottles of Mona Vie. 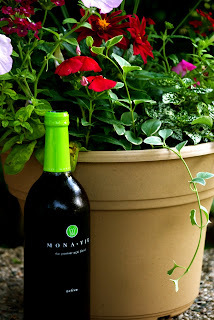 What is Mona Vie, you ask? We’re told, 1-2 oz. of this every day will make you healthier, feel more energized, etc. 19 “body-beneficial” fruits are packed into this stuff…that’s a lot of fruit. It’s a good thing it’s fruit, because if it was vegetables (v8 – yuck! ), I couldn’t do it. It tastes pretty good, though. So, we’re trying it out until our supply runs out. And we’ll see if there are any noticeable differences in the way we’re feeling. So, I’ve tried this blogging thing before and I must admit that I haven’t been very good at it. I never figured out how to post pictures in my old blog, so I got bored when I looked at it and eventually stopped posting. I don’t think anyone really read that blog anyway. Most recently, Ross and I used blogs to post our thoughts while we were reading through Ecclesiastes together. These were kept private so no one except ourselves actually read them – not the point of a blog (nevertheless, a good way to write out our thoughts). I’m finally getting used to checking my own Google Reader on a regular basis and have been re-convinced by the Baughman’s that a blog is a great way to document life…whatever it may bring. Stay tuned for life updates, photos of recent meal creations and other opportunities we create to use our new camera (that we have no idea how to use), random thoughts and links, and most likely a lot of pictures of Parker. Something tells me Ross will be satisfied with the blog if he can reference Snoop Dogg at least once. We’ll see how it goes!